PS DANCE!, an inspirational film about dance education in New York City public schools, has been nominated for a New York Emmy in the Documentary category. The New York Emmy Awards will be held on Saturday, March 19, 2016. PS DANCE! showcases the profound effects of consistent and sequential dance education programs in five NYC public schools. It debuted on public television on THIRTEEN/WNET, WLIW21 and NJTV in May 2015 and has been broadcast on public television channels across the nation. New York, NY, March 16, 2016	(Newswire.com) - PS DANCE!, an inspirational film about dance education in New York City public schools, has been nominated for a New York Emmy in the Documentary category. The New York Emmy Awards will be held on Saturday, March 19, 2016. PS DANCE! showcases the profound effects of consistent and sequential dance education programs in five NYC public schools. It debuted on public television on THIRTEEN/WNET, WLIW21 and NJTV in May 2015 and has been broadcast on public television channels across the nation including stations in Denver, Tampa, Rochester, Miami, Boston, Albany, Orlando, Detroit, San Francisco, Phoenix, Cleveland, New York and New Jersey. After the initial broadcast, the full film became available for online viewing at http://www.thirteen.org/programs/thirteen-specials/ps-dance. PS DANCE! was a featured screening at Dance Films Association’s 2016 Dance on Camera Festival and has been discussed on panels during Dance/NYC’s 2016 Symposium, the 2015 National Dance Education Organization conference, and more. Hosted by veteran TV journalist Paula Zahn and filmed in the classrooms of five NYC public school full-time certified dance educators, this film reveals the impact that dance instruction has on students’ aesthetic, artistic and expressive development. While every child is born with the innate inclination to create, imagine and dance, PS DANCE! highlights how the Blueprint for Teaching and Learning in Dance, PreK-12, supports dance teachers in developing these qualities. The Blueprint, used by dance teachers citywide, frames this documentary created by Executive Producer Jody Gottfried Arnhold, Director and Producer Nel Shelby, and Dance Education Consultant Joan Finkelstein. The film was developed in collaboration with the NYC Department of Education Office of Arts and Special Projects. The documentary captures a typical day in the classrooms of five extraordinary master dance educators: Catherine Gallant (Pre-K-5), Battery Park City’s P.S. 89; Ana Nery Fragoso (K-5), the current NYCDOE Director of Dance, P.S 315 in Midwood; Michael Kerr (6-8), Brooklyn’s New Voices School of Academic & Creative Arts; Patricia Dye (9-12), Science Skills Center High School for Science, Technology and the Creative Arts in Downtown Brooklyn; and Ani Udovicki (9-12), Frank Sinatra School of the Arts, in Long Island City. After the film’s release, Arnhold, Shelby and Finkelstein launched an organization with the mission: Dance for Every Child. Dance education enthusiasts can submit their details at psdancenyc.com and join in advocating for more dance in schools. The movement will empower implementation of quality dance programs in schools across the nation. PS DANCE! is available on DVD distributed by First Run Features and for rent or purchase on Vimeo. All proceeds from the sale of the film will go to The Fund for Public Schools for dance education programs in NYC Public Schools. Visit psdancenyc.com to join the movement to bring dance to every child and follow the discussion on social media on Facebook, Twitter and Instagram or by using the hashtags #psdancenyc and #danceforeverychild. Jody Gottfried Arnhold is a passionate dance advocate and educator. She taught dance in NYC public schools for over twenty years, founded Dance Education Laboratory 92Y (DEL), supports the dance program at NYC Dept. of Education, created the Arnhold Graduate Dance Education Program at Hunter College, and supported and mentored countless dance teachers many of whom now lead the field. She champions and supports NYC dance companies including Ballet Hispanico where she is Honorary Chair. Arnhold serves on the Board at 92Y, Harkness Foundation for Dance, Hunter College, Chairs Hunter’s Dance Advisory Committee, and is on Dance/NYC’s Advisory Committee. She has received the National Dance Education Organization’s Visionary Award, Teachers College Distinguished Alumni Award, the New York State Dance Education Association 2015 Outstanding Leadership Award, Dance Films Association’s 2016 Dance in Focus Award, and was honored by the NYC Arts in Education Roundtable and Lincoln Center Education for her commitment to dance education. She holds a B.A. from the University of Wisconsin, Madison, and M.A. in Dance Education from Teachers College, Columbia University, and is a Certified Movement Analyst. Arnhold continues these efforts as the Executive Producer of the NY Emmy nominated documentary, PS DANCE!, to raise awareness and advocate for her mission Dance for Every Child. It is not just a movie. It is a movement – and Arnhold leads it! Nel Shelby, Director and Producer of PS DANCE! and founder and principal at dance film production company Nel Shelby Productions, is deeply dedicated to the preservation and promotion of dance through documentation of live performance, creative video marketing and original filmmaking. Her NYC-based video production company, Nel Shelby Productions, has grown to encompass a long and diverse list of dance clients, and her team has filmed performances at venues throughout the greater New York area and beyond. Shelby serves as Festival Videographer for the internationally celebrated Jacob’s Pillow Dance Festival each summer and is also Resident Videographer at the Vail International Dance Festival. Her longer-form, half-hour documentary on Vail's festival, The Altitude of Dance, debuted on Rocky Mountain PBS in May 2013. In 2016, she will have a premiere screening of a new half-hour dance documentary featuring Nejla Y. Yatkin that she filmed in Central America in 2010. Shelby created four short films for Wendy Whelan's Restless Creature, and she collaborated with Adam Barruch Dance on a short film titled "Folie a Deux," which was selected and screened at the Dance on Camera Festival in New York City and San Francisco Dance Film Festival. She has a long personal history with movement – in addition to her degree in broadcast video, she holds a B.F.A. in dance and is a certified Pilates instructor. Joan Finkelstein, Dance Education Consultant for PS DANCE! and Executive Director of the Harkness Foundation for Dance, performed professionally in modern, ballet and Afro-Caribbean dance companies and in RAGS on Broadway, choreographed for the Atlanta Ballet and the Dayton Contemporary Dance Company, and has taught children and adults across the nation. She directed the 92Y Harkness Dance Center from 1992-2004, overseeing classes, the 92Y Dance Education Laboratory (DEL) teacher-training program, performances, workshops, lectures, and social dances. As Director of Dance for the New York City Department of Education from 2004-2014, she spearheaded the Blueprint for Teaching and Learning in Dance PreK-12 and ongoing professional development for dance teachers. A member of the Dance Writing Task Force that created the new National Core Arts Standards in Dance, she received the National Dance Education Organization’s 2009 Leadership Award and the New York State Dance Education Association’s 2014 Outstanding Leadership Award. Finkelstein holds a BFA (Dance Performance) and MFA (Choreography) from NYU Tisch School of the Arts. 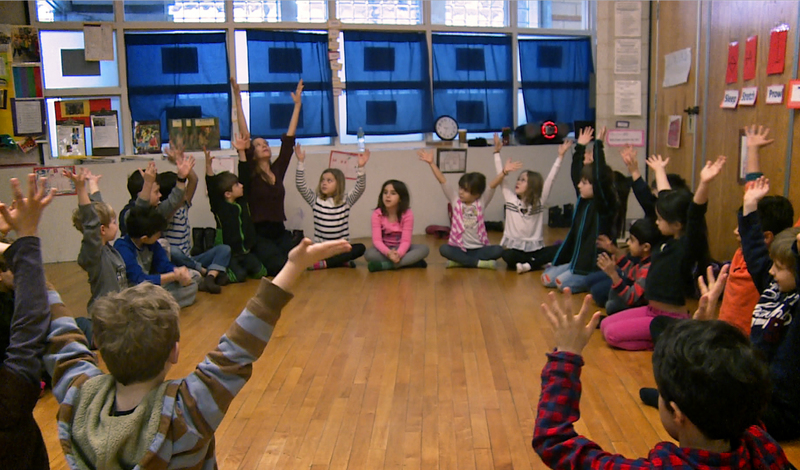 Step inside the halls of five NYC public schools and celebrate dance! Hosted by veteran TV journalist Paula Zahn, PS DANCE! is a New York Emmy-nominated documentary that captures what happens when students have dance in their curriculum.